My sons Wilson and Hunter went to California and visited Yosemite National Park with our friend Sherwood Haisty Jr. (Sherwood on left) March 21-27. Here you can see all the snow they had to deal with. Dr Price, who directs excavations at the Qumran plateau in Israel, the site of the community that produced the dead sea scrolls some 2,000 years ago, expertly guides you through the latest archaeological finds that have changed the way we understand the world of the bible. (Part 5 of 6 in the film series The Stones Cry Out). From time to time you will read articles in the Arkansas press by such writers as John Brummett, Max Brantley and Gene Lyons that poke fun at those that actually believe the Bible is historically accurate when in fact the Bible is backed up by many archaeological facts. The Book of Mormon is blindly accepted even though archaeology has disproven many of the facts that are claimed by it. For instance, swine did not exist in North America when they said they did. The Book of Mormon suggests that swine existed and were domesticated among the Jaredites. There have not been any remains, references, artwork, tools, or any other evidence suggesting that swine were ever present in the pre-entrada New World. Puru “The lot of Yahali” 9th Century B.C.E. 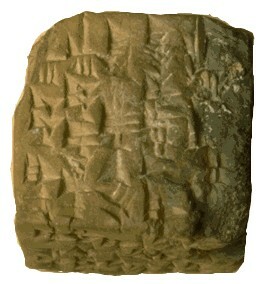 This cube is inscribed with the name and titles of Yahali and a prayer: “In his year assigned to him by lot (puru) may the harvest of the land of Assyria prosper and thrive, in front of the gods Assur and Adad may his lot (puru) fall.” It dates from the reign of Salmaneser III (858-824 B.C.E.) and was used in the ceremonies appointing Yahali eponym, i.e. naming the Assyrian year after him (833 and 825 B.C.). It provides a prototype (the only one ever recovered) for the lots (purim) cast by Haman to fix a date for the destruction of the Jews of the Persian Empire, ostensibly in the fifth century B.C.E. (Esther 3:7; cf. 9:26). Place of publication: YOS 9:73. My sons Wilson (on left) and Hunter went to California and visited Yosemite National Park with our friend Sherwood Haisty Jr. (Sherwood on right) They were there from March 21 to March 27. Here you can see all the snow they had to deal with. Free-lance columnist Rex Nelson is the president of Arkansas’ Independent Colleges and Universities. He’s also the author of the Southern Fried blog at rexnelsonsouthernfried. com. Rex Nelson wrote in the Arkansas Democrat-Gazette on April 2, 2011 a great article called “Arkansas Bucket List.” The readers of his blog http://www.rexnelsonsouthernfried.com came up with a list of things you must do at least once in your life to be considered a well-rounded Arkansan. Nelson asked others to add their suggestions at his website. I am going through the list slowly. « Abortionist Bernard Nathanson turned pro-life activist (part 7) Have you wondered why we have abortion in the USA?